For other uses, see GHG. A greenhouse gas (abbrev. 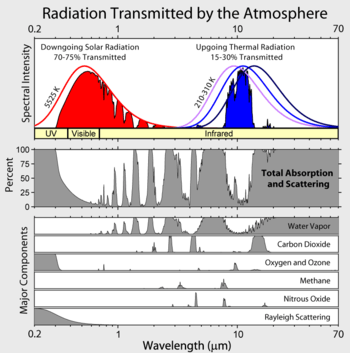 GHG) is a gas in an atmosphere that absorbs and emits radiation within the thermal infrared range. This process is the fundamental cause of the greenhouse effect. The primary greenhouse gases in Earth's atmosphere are water vapor, carbon dioxide, methane, nitrous oxide, and ozone. Without greenhouse gases, the average temperature of Earth's surface would be about −18 °C (0 °F), rather than the present average of 15 °C (59 °F). In the Solar System, the atmospheres of Venus, Mars and Titan also contain gases that cause a greenhouse effect. Human activities since the beginning of the Industrial Revolution (taken as the year 1750) have produced a 40% increase in the atmospheric concentration of carbon dioxide, from 280 ppm in 1750 to 400 ppm in 2015. This increase has occurred despite the uptake of a large portion of the emissions by various natural "sinks" involved in the carbon cycle. Anthropogenic carbon dioxide (CO2) emissions (i.e. emissions produced by human activities) come from combustion of carbon-based fuels, principally coal, oil, and natural gas, along with deforestation, soil erosion and animal agriculture. It has been estimated that if greenhouse gas emissions continue at the present rate, Earth's surface temperature could exceed historical values as early as 2047, with potentially harmful effects on ecosystems, biodiversity and the livelihoods of people worldwide. Recent estimates suggest that on the current emissions trajectory the Earth could pass a threshold of 2°C global warming, which the United Nations' IPCC designated as the upper limit for "dangerous" global warming, by 2036. Atmospheric concentrations of greenhouse gases are determined by the balance between sources (emissions of the gas from human activities and natural systems) and sinks (the removal of the gas from the atmosphere by conversion to a different chemical compound). The proportion of an emission remaining in the atmosphere after a specified time is the "airborne fraction" (AF). More precisely, the annual airborne fraction is the ratio of the atmospheric increase in a given year to that year's total emissions. 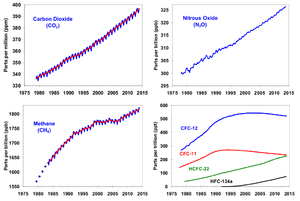 Over the last 50 years (1956–2006) the airborne fraction for CO2 has been increasing at 0.25 ± 0.21%/year. 2 and monatomic molecules such as argon (Ar) have no net change in the distribution of their electrical charges when they vibrate and hence are almost totally unaffected by infrared radiation. Although molecules containing two atoms of different elements such as carbon monoxide (CO) or hydrogen chloride (HCl) absorb infrared radiation, these molecules are short-lived in the atmosphere owing to their reactivity and solubility. Therefore, they do not contribute significantly to the greenhouse effect and usually are omitted when discussing greenhouse gases. 4 are intertwined by both consuming OH radicals. In any case, the calculation of the total radiative effect needs to include both the direct and indirect forcing. 4 increases as well as producing water vapor in the stratosphere. The major non-gas contributor to Earth's greenhouse effect, clouds, also absorb and emit infrared radiation and thus have an effect on radiative properties of the greenhouse gases. Clouds are water droplets or ice crystals suspended in the atmosphere. The contribution of each gas to the greenhouse effect is affected by the characteristics of that gas, its abundance, and any indirect effects it may cause. For example, the direct radiative effect of a mass of methane is about 72 times stronger than the same mass of carbon dioxide over a 20-year time frame but it is present in much smaller concentrations so that its total direct radiative effect is smaller, in part due to its shorter atmospheric lifetime. On the other hand, in addition to its direct radiative impact, methane has a large, indirect radiative effect because it contributes to ozone formation. Shindell et al. (2005) argue that the contribution to climate change from methane is at least double previous estimates as a result of this effect. Aside from water vapor, which has a residence time of about nine days, major greenhouse gases are well mixed and take many years to leave the atmosphere. Although it is not easy to know with precision how long it takes greenhouse gases to leave the atmosphere, there are estimates for the principal greenhouse gases. Jacob (1999) defines the lifetime of an atmospheric species X in a one-box model as the average time that a molecule of X remains in the box. Mathematically can be defined as the ratio of the mass (in kg) of X in the box to its removal rate, which is the sum of the flow of X out of the box ( ), chemical loss of X ( ), and deposition of X ( ) (all in kg/s): . If one stopped pouring any of this gas into the box, then after a time , its concentration would be about halved. Carbon dioxide has a variable atmospheric lifetime, and cannot be specified precisely. The atmospheric lifetime of CO2 is estimated of the order of 30–95 years. This figure accounts for CO2 molecules being removed from the atmosphere by mixing into the ocean, photosynthesis, and other processes. However, this excludes the balancing fluxes of CO2 into the atmosphere from the geological reservoirs, which have slower characteristic rates. Although more than half of the CO2 emitted is removed from the atmosphere within a century, some fraction (about 20%) of emitted CO2 remains in the atmosphere for many thousands of years. Similar issues apply to other greenhouse gases, many of which have longer mean lifetimes than CO2. E.g., N2O has a mean atmospheric lifetime of 114 years. Earth absorbs some of the radiant energy received from the sun, reflects some of it as light and reflects or radiates the rest back to space as heat. Earth's surface temperature depends on this balance between incoming and outgoing energy. If this energy balance is shifted, Earth's surface could become warmer or cooler, leading to a variety of changes in global climate. A number of natural and man-made mechanisms can affect the global energy balance and force changes in Earth's climate. Greenhouse gases are one such mechanism. Greenhouse gases in the atmosphere absorb and re-emit some of the outgoing energy radiated from Earth's surface, causing that heat to be retained in the lower atmosphere. As explained above, some greenhouse gases remain in the atmosphere for decades or even centuries, and therefore can affect Earth's energy balance over a long time period. Factors that influence Earth's energy balance can be quantified in terms of "radiative climate forcing." Positive radiative forcing indicates warming (for example, by increasing incoming energy or decreasing the amount of energy that escapes to space), whereas negative forcing is associated with cooling. The global warming potential (GWP) depends on both the efficiency of the molecule as a greenhouse gas and its atmospheric lifetime. GWP is measured relative to the same mass of CO2 and evaluated for a specific timescale. Thus, if a gas has a high (positive) radiative forcing but also a short lifetime, it will have a large GWP on a 20-year scale but a small one on a 100-year scale. Conversely, if a molecule has a longer atmospheric lifetime than CO2 its GWP will increase with the timescale considered. Carbon dioxide is defined to have a GWP of 1 over all time periods. Methane has an atmospheric lifetime of 12 ± 3 years. The 2007 IPCC report lists the GWP as 72 over a time scale of 20 years, 25 over 100 years and 7.6 over 500 years. A 2014 analysis, however, states that although methane's initial impact is about 100 times greater than that of CO2, because of the shorter atmospheric lifetime, after six or seven decades, the impact of the two gases is about equal, and from then on methane's relative role continues to decline. The decrease in GWP at longer times is because methane is degraded to water and CO2 through chemical reactions in the atmosphere. This diagram shows a simplified representation of the contemporary global carbon cycle. Changes are measured in gigatons of carbon per year (GtC/y). Canadell et al. 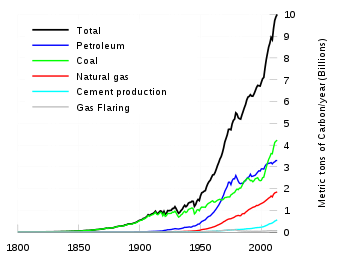 (2007) estimated the growth rate of global average atmospheric CO2 for 2000–2006 as 1.93 parts-per-million per year (4.1 petagrams of carbon per year). 4 vary between glacial and interglacial phases, and concentrations of these gases correlate strongly with temperature. Direct data does not exist for periods earlier than those represented in the ice core record, a record that indicates CO2 mole fractions stayed within a range of 180 ppm to 280 ppm throughout the last 800,000 years, until the increase of the last 250 years. However, various proxies and modeling suggests larger variations in past epochs; 500 million years ago CO2 levels were likely 10 times higher than now. Indeed, higher CO2 concentrations are thought to have prevailed throughout most of the Phanerozoic eon, with concentrations four to six times current concentrations during the Mesozoic era, and ten to fifteen times current concentrations during the early Palaeozoic era until the middle of the Devonian period, about 400 Ma. The spread of land plants is thought to have reduced CO2 concentrations during the late Devonian, and plant activities as both sources and sinks of CO2 have since been important in providing stabilising feedbacks. Earlier still, a 200-million year period of intermittent, widespread glaciation extending close to the equator (Snowball Earth) appears to have been ended suddenly, about 550 Ma, by a colossal volcanic outgassing that raised the CO2 concentration of the atmosphere abruptly to 12%, about 350 times modern levels, causing extreme greenhouse conditions and carbonate deposition as limestone at the rate of about 1 mm per day. This episode marked the close of the Precambrian eon, and was succeeded by the generally warmer conditions of the Phanerozoic, during which multicellular animal and plant life evolved. No volcanic carbon dioxide emission of comparable scale has occurred since. In the modern era, emissions to the atmosphere from volcanoes are only about 1% of emissions from human sources. Since the beginning of the Industrial Revolution, the concentrations of most of the greenhouse gases have increased. For example, the mole fraction of carbon dioxide has increased from 280 ppm by about 36% to 380 ppm, or 100 ppm over modern pre-industrial levels. The first 50 ppm increase took place in about 200 years, from the start of the Industrial Revolution to around 1973.; however the next 50 ppm increase took place in about 33 years, from 1973 to 2006. Today, the stock of carbon in the atmosphere increases by more than 3 million tonnes per annum (0.04%) compared with the existing stock. This increase is the result of human activities by burning fossil fuels, deforestation and forest degradation in tropical and boreal regions. 6), hydrofluorocarbons (HFCs), and perfluorocarbons (PFCs)) are the major anthropogenic greenhouse gases,:147 and are regulated under the Kyoto Protocol international treaty, which came into force in 2005. Emissions limitations specified in the Kyoto Protocol expired in 2012. The Cancún agreement, agreed in 2010, includes voluntary pledges made by 76 countries to control emissions. At the time of the agreement, these 76 countries were collectively responsible for 85% of annual global emissions. Although CFCs are greenhouse gases, they are regulated by the Montreal Protocol, which was motivated by CFCs' contribution to ozone depletion rather than by their contribution to global warming. Note that ozone depletion has only a minor role in greenhouse warming though the two processes often are confused in the media. On 15 October 2016, negotiators from over 170 nations meeting at the summit of the United Nations Environment Programme reached a legally binding accord to phase out hydrofluorocarbons (HFCs) in an amendment to the Montreal Protocol. According to UNEP global tourism is closely linked to climate change. Tourism is a significant contributor to the increasing concentrations of greenhouse gases in the atmosphere. Tourism accounts for about 50% of traffic movements. Rapidly expanding air traffic contributes about 2.5% of the production of CO2. The number of international travelers is expected to increase from 594 million in 1996 to 1.6 billion by 2020, adding greatly to the problem unless steps are taken to reduce emissions. The road haulage industry plays a part in production of CO2, contributing around 20% of the UK's total carbon emissions a year, with only the energy industry having a larger impact at around 39%. Average carbon emissions within the haulage industry are falling—in the thirty-year period from 1977 to 2007, the carbon emissions associated with a 200-mile journey fell by 21 percent; NOx emissions are also down 87 percent, whereas journey times have fallen by around a third. Due to their size, HGVs often receive criticism regarding their CO2 emissions; however, rapid development in engine technology and fuel management is having a largely positive effect. 4 and CO2. Thus, water vapor responds to and amplifies effects of the other greenhouse gases. The Clausius–Clapeyron relation establishes that more water vapor will be present per unit volume at elevated temperatures. This and other basic principles indicate that warming associated with increased concentrations of the other greenhouse gases also will increase the concentration of water vapor (assuming that the relative humidity remains approximately constant; modeling and observational studies find that this is indeed so). Because water vapor is a greenhouse gas, this results in further warming and so is a "positive feedback" that amplifies the original warming. Eventually other earth processes offset these positive feedbacks, stabilizing the global temperature at a new equilibrium and preventing the loss of Earth's water through a Venus-like runaway greenhouse effect. Between the period 1970 to 2004, GHG emissions (measured in CO2-equivalent) increased at an average rate of 1.6% per year, with CO2 emissions from the use of fossil fuels growing at a rate of 1.9% per year. Total anthropogenic emissions at the end of 2009 were estimated at 49.5 gigatonnes CO2-equivalent. :15 These emissions include CO2 from fossil fuel use and from land use, as well as emissions of methane, nitrous oxide and other GHGs covered by the Kyoto Protocol. At present, the primary source of CO2 emissions is the burning of coal, natural gas, and petroleum for electricity and heat. This figure shows the relative fraction of anthropogenic greenhouse gases coming from each of eight categories of sources, as estimated by the Emission Database for Global Atmospheric Research version 3.2, fast track 2000 project . These values are intended to provide a snapshot of global annual greenhouse gas emissions in the year 2000. The top panel shows the sum over all anthropogenic greenhouse gases, weighted by their global warming potential over the next 100 years. This consists of 72% carbon dioxide, 18% methane, 8% nitrous oxide and 1% other gases. 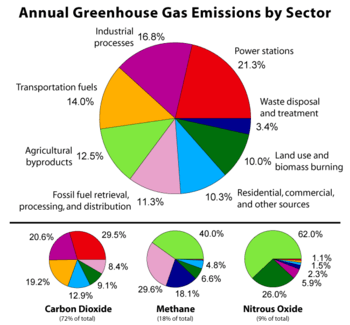 Lower panels show the comparable information for each of these three primary greenhouse gases, with the same coloring of sectors as used in the top chart. Segments with less than 1% fraction are not labeled. Time horizon of different GHGs: Contribution of a given GHG is reported as a CO2 equivalent. The calculation to determine this takes into account how long that gas remains in the atmosphere. This is not always known accurately and calculations must be regularly updated to reflect new information. These different measures are sometimes used by different countries to assert various policy/ethical positions on climate change (Banuri et al., 1996, p. 94). This use of different measures leads to a lack of comparability, which is problematic when monitoring progress towards targets. There are arguments for the adoption of a common measurement tool, or at least the development of communication between different tools. Emissions may also be measured across shorter time periods. Emissions changes may, for example, be measured against a base year of 1990. 1990 was used in the United Nations Framework Convention on Climate Change (UNFCCC) as the base year for emissions, and is also used in the Kyoto Protocol (some gases are also measured from the year 1995). :146,149 A country's emissions may also be reported as a proportion of global emissions for a particular year. Another measurement is of per capita emissions. This divides a country's total annual emissions by its mid-year population. :370 Per capita emissions may be based on historical or annual emissions (Banuri et al., 1996, pp. 106–107). Land-use change, e.g., the clearing of forests for agricultural use, can affect the concentration of GHGs in the atmosphere by altering how much carbon flows out of the atmosphere into carbon sinks. Accounting for land-use change can be understood as an attempt to measure "net" emissions, i.e., gross emissions from all GHG sources minus the removal of emissions from the atmosphere by carbon sinks (Banuri et al., 1996, pp. 92–93). Greenhouse gas intensity is a ratio between greenhouse gas emissions and another metric, e.g., gross domestic product (GDP) or energy use. The terms "carbon intensity" and "emissions intensity" are also sometimes used. GHG intensities may be calculated using market exchange rates (MER) or purchasing power parity (PPP) (Banuri et al., 1996, p. 96). Calculations based on MER show large differences in intensities between developed and developing countries, whereas calculations based on PPP show smaller differences. Cumulative energy-related CO2 emissions between the years 1850–2005 grouped into low-income, middle-income, high-income, the EU-15, and the OECD countries. 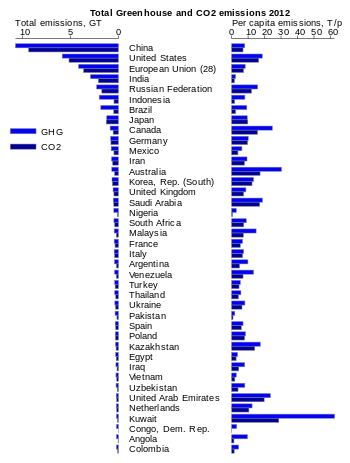 Cumulative energy-related CO2 emissions between the years 1850–2005 for individual countries. Regional trends in annual CO2 emissions from fuel combustion between 1971 and 2009. Regional trends in annual per capita CO2 emissions from fuel combustion between 1971 and 2009. The table above to the left is based on Banuri et al. (1996, p. 94). Overall, developed countries accounted for 83.8% of industrial CO2 emissions over this time period, and 67.8% of total CO2 emissions. Developing countries accounted for industrial CO2 emissions of 16.2% over this time period, and 32.2% of total CO2 emissions. The estimate of total CO2 emissions includes biotic carbon emissions, mainly from deforestation. Banuri et al. (1996, p. 94) calculated per capita cumulative emissions based on then-current population. The ratio in per capita emissions between industrialized countries and developing countries was estimated at more than 10 to 1. Using different base years for measuring emissions has an effect on estimates of national contributions to global warming. :17–18 This can be calculated by dividing a country's highest contribution to global warming starting from a particular base year, by that country's minimum contribution to global warming starting from a particular base year. Choosing between different base years of 1750, 1900, 1950, and 1990 has a significant effect for most countries. :17–18 Within the G8 group of countries, it is most significant for the UK, France and Germany. These countries have a long history of CO2 emissions (see the section on Cumulative and historical emissions). Annual per capita emissions in the industrialized countries are typically as much as ten times the average in developing countries. :144 Due to China's fast economic development, its annual per capita emissions are quickly approaching the levels of those in the Annex I group of the Kyoto Protocol (i.e., the developed countries excluding the USA). Other countries with fast growing emissions are South Korea, Iran, and Australia (which apart from the oil rich Persian Gulf states, now has the highest percapita emission rate in the world). On the other hand, annual per capita emissions of the EU-15 and the USA are gradually decreasing over time. Emissions in Russia and Ukraine have decreased fastest since 1990 due to economic restructuring in these countries. The GHG footprint, or greenhouse gas footprint, refers to the amount of GHG that are emitted during the creation of products or services. It is more comprehensive than the commonly used carbon footprint, which measures only carbon dioxide, one of many greenhouse gases. In 2009, the annual top ten emitting countries accounted for about two-thirds of the world's annual energy-related CO2 emissions. Davis and Caldeira (2010):4 found that a substantial proportion of CO2 emissions are traded internationally. The net effect of trade was to export emissions from China and other emerging markets to consumers in the US, Japan, and Western Europe. Based on annual emissions data from the year 2004, and on a per-capita consumption basis, the top-5 emitting countries were found to be (in tCO2 per person, per year): Luxembourg (34.7), the US (22.0), Singapore (20.2), Australia (16.7), and Canada (16.6). :5 Carbon Trust research revealed that approximately 25% of all CO2 emissions from human activities 'flow' (i.e. are imported or exported) from one country to another. Major developed economies were found to be typically net importers of embodied carbon emissions — with UK consumption emissions 34% higher than production emissions, and Germany (29%), Japan (19%) and the USA (13%) also significant net importers of embodied emissions. Governments have taken action to reduce GHG emissions (climate change mitigation). Assessments of policy effectiveness have included work by the Intergovernmental Panel on Climate Change, International Energy Agency, and United Nations Environment Programme. Policies implemented by governments have included national and regional targets to reduce emissions, promoting energy efficiency, and support for renewable energy such as Solar energy as an effective use of renewable energy because solar uses energy from the sun and does not release pollutants into the air. A wide range of projections of future GHG emissions have been produced. Rogner et al. (2007) assessed the scientific literature on GHG projections. Rogner et al. (2007) concluded that unless energy policies changed substantially, the world would continue to depend on fossil fuels until 2025–2030. Projections suggest that more than 80% of the world's energy will come from fossil fuels. This conclusion was based on "much evidence" and "high agreement" in the literature. Projected annual energy-related CO2 emissions in 2030 were 40–110% higher than in 2000, with two-thirds of the increase originating in developing countries. Projected annual per capita emissions in developed country regions remained substantially lower (2.8–5.1 tonnes CO2) than those in developed country regions (9.6–15.1 tonnes CO2). Projections consistently showed increase in annual world GHG emissions (the "Kyoto" gases, measured in CO2-equivalent) of 25–90% by 2030, compared to 2000. A literature review of numerous energy sources CO2 emissions by the IPCC in 2011, found that, the CO2 emission value that fell within the 50th percentile of all total life cycle emissions studies conducted was as follows. 2 do not absorb infrared radiation (called, at that time, "dark radiation"), while water (both as true vapor and condensed in the form of microscopic droplets suspended in clouds) and CO2 and other poly-atomic gaseous molecules do absorb infrared radiation. In the early 20th century researchers realized that greenhouse gases in the atmosphere made Earth's overall temperature higher than it would be without them. During the late 20th century, a scientific consensus evolved that increasing concentrations of greenhouse gases in the atmosphere cause a substantial rise in global temperatures and changes to other parts of the climate system, with consequences for the environment and for human health. 1 2 "IPCC AR4 SYR Appendix Glossary" (PDF). Retrieved 14 December 2008. 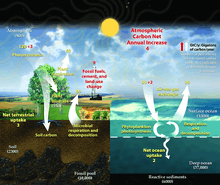 ↑ "NASA GISS: Science Briefs: Greenhouse Gases: Refining the Role of Carbon Dioxide". www.giss.nasa.gov. Retrieved 2016-04-26. 1 2 3 From non-copyrighted source: Blasing, T. J. 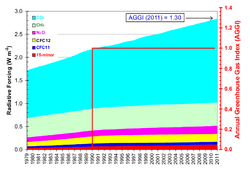 (February 2013), Current Greenhouse Gas Concentrations, doi:10.3334/CDIAC/atg.032 , on CDIAC 2013. Details on copyright status: Frequently Asked Global Change Questions, Q34: I would like to use a diagram, image, graph, table, or other materials from the CDIAC Web site. How can I obtain permission? Are there copyright restrictions?, retrieved 2012-09-26 , on CDIAC 2013. "All of the reports, graphics, data, and other information on the CDIAC Web site are freely and publicly available without copyright restrictions. However as a professional courtesy, we ask that the original data source be acknowledged." ↑ "Frequently asked global change questions". Carbon Dioxide Information Analysis Center. ↑ ESRL Web Team (14 January 2008). "Trends in carbon dioxide". Esrl.noaa.gov. Retrieved 2011-09-11. ↑ "AR4 SYR Synthesis Report Summary for Policymakers – 2 Causes of change". ipcc.ch. ↑ Mann, Michael E. (2014-04-01). "Earth Will Cross the Climate Danger Threshold by 2036". Scientific American. Retrieved 30 August 2016. ↑ "Chapter 7: Couplings Between Changes in the Climate System and Biogeochemistry" (PDF). IPCC WG1 AR4 Report. IPCC. 2007. p. FAQ 7.1; report page 512; pdf page 14. Retrieved 11 July 2011. ↑ Canadell, J. G.; Le Quere, C.; Raupach, M. R.; Field, C. B.; Buitenhuis, E. T.; Ciais, P.; Conway, T. J.; Gillett, N. P.; Houghton, R. A.; Marland, G. (2007). "Contributions to accelerating atmospheric CO2 growth from economic activity, carbon intensity, and efficiency of natural sinks". Proc. Natl. Acad. Sci. U.S.A. 104 (47): 18866–70. Bibcode:2007PNAS..10418866C. doi:10.1073/pnas.0702737104. PMC 2141868 . PMID 17962418. ↑ http://earthobservatory.nasa.gov/Library/RemoteSensingAtmosphere/remote_sensing6.html Archived 20 September 2008 at the Wayback Machine. 1 2 Forster, P.; et al. (2007). "2.10.3 Indirect GWPs". Changes in Atmospheric Constituents and in Radiative Forcing. Contribution of Working Group I to the Fourth Assessment Report of the Intergovernmental Panel on Climate Change. Cambridge University Press. Retrieved 2012-12-02. ↑ MacCarty, N. "Laboratory Comparison of the Global-Warming Potential of Six Categories of Biomass Cooking Stoves" (PDF). Approvecho Research Center. 1 2 3 Kiehl, J.T. ; Kevin E. Trenberth (1997). "Earth's annual global mean energy budget" (PDF). Bulletin of the American Meteorological Society. 78 (2): 197–208. Bibcode:1997BAMS...78..197K. doi:10.1175/1520-0477(1997)078<0197:EAGMEB>2.0.CO;2. Archived from the original (PDF) on 30 March 2006. Retrieved 1 May 2006. 1 2 3 "Water vapour: feedback or forcing?". RealClimate. 6 April 2005. Retrieved 1 May 2006. ↑ Schmidt, G. A.; R. Ruedy; R. L. Miller; A. A. Lacis (2010), "The attribution of the present-day total greenhouse effect" (PDF), J. Geophys. Res., 115, Bibcode:2010JGRD..11520106S, doi:10.1029/2010JD014287 , D20106. Web page for paper. ↑ Shindell, Drew T. (2005). "An emissions-based view of climate forcing by methane and tropospheric ozone". Geophysical Research Letters. 32 (4): L04803. Bibcode:2005GeoRL..3204803S. doi:10.1029/2004GL021900. ↑ "Methane's Impacts on Climate Change May Be Twice Previous Estimates". Nasa.gov. 30 November 2007. Retrieved 2010-10-16. ↑ Isaksen, Ivar S. A.; Michael Gauss; Gunnar Myhre; Katey M. Walter Anthony; Carolyn Ruppel (20 April 2011). "Strong atmospheric chemistry feedback to climate warming from Arctic methane emissions" (PDF). Global Biogeochemical Cycles. 25 (2). Bibcode:2011GBioC..25B2002I. doi:10.1029/2010GB003845. Retrieved 29 July 2011. ↑ "AGU Water Vapor in the Climate System". Eso.org. 27 April 1995. Retrieved 2011-09-11. ↑ Betts (2001). "6.3 Well-mixed Greenhouse Gases". 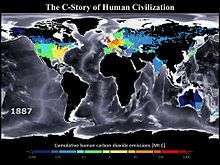 Chapter 6 Radiative Forcing of Climate Change. Working Group I: The Scientific Basis IPCC Third Assessment Report — Climate Change 2001. UNEP/GRID-Arendal — Publications. Retrieved 2010-10-16. 1 2 Jacob, Daniel (1999). Introduction to atmospheric chemistry. Princeton University Press. pp. 25–26. ISBN 0-691-00185-5. ↑ "How long will global warming last?". RealClimate. Retrieved 2012-06-12. ↑ Jacobson, MZ (2005). "Correction to "Control of fossil-fuel particulate black carbon and organic matter, possibly the most effective method of slowing global warming."". J. Geophys. Res. 110. pp. D14105. doi:10.1029/2005JD005888. ↑ Archer, David (2009). "Atmospheric lifetime of fossil fuel carbon dioxide". Annual Review of Earth and Planetary Sciences. 37. pp. 117–134. doi:10.1146/annurev.earth.031208.100206. ↑ Meehl, G. A. (2007). "Frequently Asked Question 10.3: If emissions of greenhouse gases are reduced, how quickly do their concentrations in the atmosphere decrease?". In S. Solomon; et al. Chapter 10: Global Climate Projections. Climate Change 2007: The Physical Science Basis. Contribution of Working Group I to the Fourth Assessment Report of the Intergovernmental Panel on Climate Change. Cambridge University Press (CUP), Cambridge, United Kingdom and New York, USA. : Print version:CUP. This version: IPCC website. Retrieved 2011-06-01. ↑ See also: Archer, David (2005). "Fate of fossil fuel CO2 in geologic time" (PDF). Journal of Geophysical Research. 110 (C9): C09S05.1–6. Bibcode:2005JGRC..11009S05A. doi:10.1029/2004JC002625. Retrieved 27 July 2007. ↑ See also: Caldeira, Ken; Wickett, Michael E. (2005). "Ocean model predictions of chemistry changes from carbon dioxide emissions to the atmosphere and ocean" (PDF). Journal of Geophysical Research. 110 (C9): C09S04.1–12. Bibcode:2005JGRC..11009S04C. doi:10.1029/2004JC002671. Archived from the original (PDF) on 10 August 2007. Retrieved 27 July 2007. 1 2 3 4 5 6 7 8 9 Edited quote from public-domain source: "Climate Change Indicators in the United States". U.S. Environmental Protection Agency (EPA). 2010. Greenhouse Gases: Figure 1. 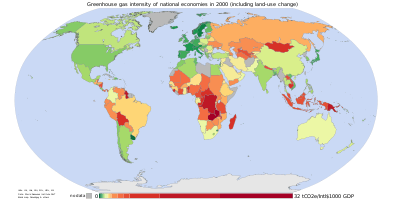 The Annual Greenhouse Gas Index, 1979–2008: Background. . This publication is also available as a PDF (page 18). ↑ David L. Chandler, How to count methane emissions, MIT News, April 25, 2014 (Accessed Jan. 15, 2015). Referenced paper is Jessika Trancik and Morgan Edwards, Climate impacts of energy technologies depend on emissions timing, Nature Climate Change, Volume 4, April 25, 2014, p. 347 (Accessed Jan. 15, 2015). ↑ St. Fleur, Nicholas (10 November 2015). "Atmospheric Greenhouse Gas Levels Hit Record, Report Says". New York Times. Retrieved 11 November 2015. ↑ Ritter, Karl (9 November 2015). "UK: In 1st, global temps average could be 1 degree C higher". AP News. Retrieved 11 November 2015. ↑ Cole, Steve; Gray, Ellen (14 December 2015). "New NASA Satellite Maps Show Human Fingerprint on Global Air Quality". NASA. Retrieved 14 December 2015. ↑ "Chapter 1 Historical Overview of Climate Change Science — FAQ 1.3 Figure 1 description page 116" (PDF). Climate Change 2007: The Physical Science Basis. Contribution of Working Group I to the Fourth Assessment Report of the Intergovernmental Panel on Climate Change. Intergovernmental Panel on Climate Change. 5 February 2007. Retrieved 25 April 2008. ↑ "Chapter 3, IPCC Special Report on Emissions Scenarios, 2000". Intergovernmental Panel on Climate Change. 2000. Retrieved 2010-10-16. ↑ "AR4 SYR SPM page 5" (PDF). Retrieved 2010-10-16. 1 2 3 Ehhalt, D.; et al., "Ch 4. Atmospheric Chemistry and Greenhouse Gases", Table 4.1 , in IPCC TAR WG1 2001, pp. 244–245. Referred to by: Blasing, T. J. (February 2013), Current Greenhouse Gas Concentrations, doi:10.3334/CDIAC/atg.032 , on CDIAC 2013. Based on Blasing et al. (2013): Pre-1750 concentrations of CH4,N2O and current concentrations of O3, are taken from Table 4.1 (a) of the IPCC Intergovernmental Panel on Climate Change), 2001. Following the convention of IPCC (2001), inferred global-scale trace-gas concentrations from prior to 1750 are assumed to be practically uninfluenced by human activities such as increasingly specialized agriculture, land clearing, and combustion of fossil fuels. Preindustrial concentrations of industrially manufactured compounds are given as zero. The short atmospheric lifetime of ozone (hours-days) together with the spatial variability of its sources precludes a globally or vertically homogeneous distribution, so that a fractional unit such as parts per billion would not apply over a range of altitudes or geographical locations. Therefore a different unit is used to integrate the varying concentrations of ozone in the vertical dimension over a unit area, and the results can then be averaged globally. This unit is called a Dobson Unit (D.U. ), after G. M. B. Dobson, one of the first investigators of atmospheric ozone. A Dobson unit is the amount of ozone in a column that, unmixed with the rest of the atmosphere, would be 10 micrometers thick at standard temperature and pressure. ↑ Because atmospheric concentrations of most gases tend to vary systematically over the course of a year, figures given represent averages over a 12-month period for all gases except ozone (O3), for which a current global value has been estimated (IPCC, 2001, Table 4.1a). CO2 averages for year 2012 are taken from the National Oceanic and Atmospheric Administration, Earth System Research Laboratory, web site: www.esrl.noaa.gov/gmd/ccgg/trends maintained by Dr. Pieter Tans. For other chemical species, the values given are averages for 2011. These data are found on the CDIAC AGAGE web site: http://cdiac.ornl.gov/ndps/alegage.html or the AGAGE home page: http://agage.eas.gatech.edu. 1 2 Forster, P.; et al., "Ch 2: Changes in Atmospheric Constituents and in Radiative Forcing", Table 2.1 , in IPCC AR4 WG1 2007, p. 141. Referred to by: Blasing, T. J. (February 2013), Current Greenhouse Gas Concentrations, doi:10.3334/CDIAC/atg.032 , on CDIAC 2013. For the latest updates, see the NOAA Annual Greenhouse Gas Index at: . ↑ Recent CO2 concentration (395.4 ppm) is the 2013 average taken from globally averaged marine surface data given by the National Oceanic and Atmospheric Administration Earth System Research Laboratory, website: http://www.esrl.noaa.gov/gmd/ccgg/trends/index.html#global. Please read the material on that web page and reference Dr. Pieter Tans when citing this average (Dr. Pieter Tans, NOAA/ESRL http://www.esrl.noaa.gov/gmd/ccgg/trends). The oft-cited Mauna Loa average for 2012 is 393.8 ppm, which is a good approximation although typically about 1 ppm higher than the spatial average given above. Refer to http://www.esrl.noaa.gov/gmd/ccgg/trends for records back to the late 1950s. 6 values are from the AGAGE gas chromatography – mass spectrometer (gc-ms) Medusa measuring system. 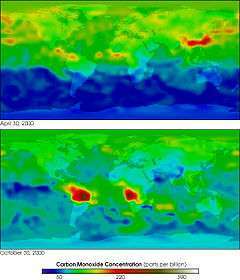 Source: Advanced Global Atmospheric Gases Experiment (AGAGE) data posted on CDIAC web site at: http://cdiac.ornl.gov/ftp/ale_gage_Agage/. These data are compiled from data on finer time scales in the ALE/GAGE/AGAGE database (Prinn et al., 2000). These data represent the work of several investigators at various institutions; guidelines on citing the various parts of the AGAGE database are found within the ALE/GAGE/AGAGE database, see: . 6 from 1970 through 1999, obtained from Antarctic firn (consolidated deep snow) air samples, can be found in W. T. Sturges et al. ↑ Berner, Robert A. (January 1994). "GEOCARB II: a revised model of atmospheric CO2 over Phanerozoic time" (PDF). American Journal of Science. 294 (1): 56–91. doi:10.2475/ajs.294.1.56. ↑ Royer, D. L.; R. A. Berner; D. J. Beerling (2001). "Phanerozoic atmospheric CO2 change: evaluating geochemical and paleobiological approaches". Earth-Science Reviews. 54 (4): 349–92. Bibcode:2001ESRv...54..349R. doi:10.1016/S0012-8252(00)00042-8. ↑ Berner, Robert A.; Kothavala, Zavareth (2001). "GEOCARB III: a revised model of atmospheric CO2 over Phanerozoic time" (PDF). American Journal of Science. 301 (2): 182–204. doi:10.2475/ajs.301.2.182. ↑ Beerling, D. J.; Berner, R. A. (2005). 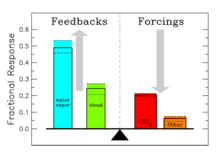 "Feedbacks and the co-evolution of plants and atmospheric CO2". Proc. Natl. Acad. Sci. U.S.A. 102 (5): 1302–5. Bibcode:2005PNAS..102.1302B. doi:10.1073/pnas.0408724102. PMC 547859 . PMID 15668402. 1 2 Hoffmann, PF; AJ Kaufman; GP Halverson; DP Schrag (1998). "A neoproterozoic snowball earth". Science. 281 (5381): 1342–6. Bibcode:1998Sci...281.1342H. doi:10.1126/science.281.5381.1342. PMID 9721097. ↑ Gerlach, TM (1991). "Present-day CO2 emissions from volcanoes". Transactions of the American Geophysical Union. 72 (23): 249–55. Bibcode:1991EOSTr..72..249.. doi:10.1029/90EO10192. ↑ See also: "U.S. Geological Survey". 14 June 2011. Retrieved 15 October 2012. 4 and CO2". Global Biogeochemical Cycles. 16: 1010. Bibcode:2002GBioC..16a..10F. doi:10.1029/2001GB001417. ↑ Friederike Wagner; Bent Aaby; Henk Visscher (2002). "Rapid atmospheric CO2 changes associated with the 8,200-years-B.P. cooling event". Proc. Natl. Acad. Sci. U.S.A. 99 (19): 12011–4. Bibcode:2002PNAS...9912011W. doi:10.1073/pnas.182420699. PMC 129389 . PMID 12202744. ↑ Andreas Indermühle; Bernhard Stauffer; Thomas F. Stocker (1999). "Early Holocene Atmospheric CO2 Concentrations". Science. 286 (5446): 1815. doi:10.1126/science.286.5446.1815a. "Early Holocene atmospheric CO2 concentrations". Science. Retrieved 26 May 2005. ↑ H. J. Smith; M. Wahlen; D. Mastroianni (1997). "The CO2 concentration of air trapped in GISP2 ice from the Last Glacial Maximum-Holocene transition". Geophysical Research Letters. 24 (1): 1–4. Bibcode:1997GeoRL..24....1S. doi:10.1029/96GL03700. ↑ "Monthly Average Carbon Dioxide Concentration, Mauna Loa Observatory" (PDF). Carbon Dioxide Information Analysis Center. 2005. Retrieved 14 December 2008. ↑ Dr. Pieter Tans (3 May 2008) "Annual CO2 mole fraction increase (ppm)" for 1959–2007 National Oceanic and Atmospheric Administration Earth System Research Laboratory, Global Monitoring Division (additional details; see also K. A. Masarie; P. P. Tans (1995). "Extension and integration of atmospheric carbon dioxide data into a globally consistent measurement record". J. Geophys. Research. 100: 11593–610. Bibcode:1995JGR...10011593M. doi:10.1029/95JD00859. 1 2 "Climate Change Indicators in the United States". NOAA. 2012. Figure 4. 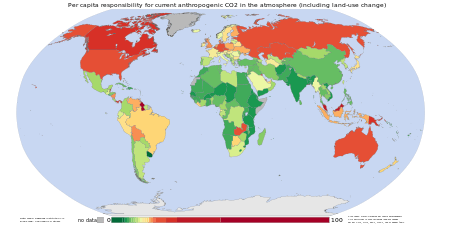 The Annual Greenhouse Gas Index, 1979–2011. ↑ "Climate Change Indicators in the United States". U.S. Environmental Protection Agency (EPA). 2010. Figure 2. 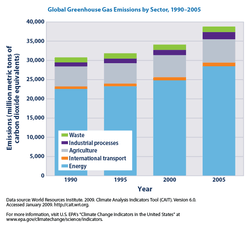 Global Greenhouse Gas Emissions by Sector, 1990–2005. ↑ "The present carbon cycle — Climate Change". Grida.no. Retrieved 2010-10-16. 1 2 Solomon, S.; D. Qin; M. Manning; Z. Chen; M. Marquis; K. B. Averyt; M. Tignor; H. L. Miller, eds. (2007). "Chapter 7. Couplings Between Changes in the Climate System and Biogeochemistry" (PDF). Climate Change 2007: The Physical Science Basis. Contribution of Working Group I to the Fourth Assessment Report of the Intergovernmental Panel on Climate Change. Cambridge, United Kingdom and New York, USA: Intergovernmental Panel on Climate Change, Cambridge University Press. ISBN 978-0-521-88009-1. Retrieved 13 May 2008. ↑ IPCC (2007d). "6.1 Observed changes in climate and their effects, and their causes". 6 Robust findings, key uncertainties. Climate Change 2007: Synthesis Report. A Contribution of Working Groups I, II, and III to the Fourth Assessment Report of the Intergovernmental Panel on Climate Change (IPCC). Geneva, Switzerland: IPCC. 1 2 "6.2 Drivers and projections of future climate changes and their impacts". 6 Robust findings, key uncertainties. Climate Change 2007: Synthesis Report. A Contribution of Working Groups I, II, and III to the Fourth Assessment Report of the Intergovernmental Panel on Climate Change (IPCC). Geneva, Switzerland: IPCC. 2007d. 1 2 "3.3.1 Impacts on systems and sectors". 3 Climate change and its impacts in the near and long term under different scenarios. Climate Change 2007: Synthesis Report. A Contribution of Working Groups I, II, and III to the Fourth Assessment Report of the Intergovernmental Panel on Climate Change (IPCC). Geneva, Switzerland: IPCC. 2007d. ↑ H. Steinfeld, P. Gerber, T. Wassenaar, V. Castel, M. Rosales, C. de Haan (2006) Livestock's long shadow. Environmental issues and options. FAO Livestock, Environment and Development (LEAD) Initiative. 1 2 Raupach, M. R.; et al. (2007). "Global and regional drivers of accelerating CO2 emissions" (PDF). Proc. Natl. Acad. Sci. U.S.A. 104 (24): 10288–93. Bibcode:2007PNAS..10410288R. doi:10.1073/pnas.0700609104. PMC 1876160 . PMID 17519334. 1 2 3 Grubb, M. (July–September 2003). "The economics of the Kyoto protocol" (PDF). World Economics. 4 (3). ↑ Lerner & K. Lee Lerner, Brenda Wilmoth (2006). "Environmental issues: essential primary sources". Thomson Gale. Retrieved 11 September 2006. 1 2 "Kyoto Protocol". United Nations Framework Convention on Climate Change. Home > Kyoto Protocol. ↑ Chris Johnston, Oliver Milman, John Vidal and agencies, "Climate change: global deal reached to limit use of hydrofluorocarbons", The Guardian, Saturday 15 October 2016 (page visited on 15 October 2016). ↑ "Nations, Fighting Powerful Refrigerant That Warms Planet, Reach Landmark Deal". New York Times. 15 October 2016. Retrieved 15 October 2016. ↑ "search engine optimisation manchester, web design agency london, e commerce manchester". freightbestpractice.org.uk. Retrieved 13 September 2015. ↑ "Inventory of U.S. Greenhouse Gas Emissions and Sinks: 1990–2010" (PDF). U.S. Environmental Protection Agency. 15 April 2012. p. 1.4. Retrieved 2 June 2012. ↑ Held, I. M.; Soden, B. J. (2000). "Water Vapor Feedback and Global Warming1". Annual Review of Energy and the Environment. 25: 441–475. doi:10.1146/annurev.energy.25.1.441. ↑ "Global Greenhouse Gas Emissions Data". EPA. Retrieved 4 March 2014. The burning of coal, natural gas, and oil for electricity and heat is the largest single source of global greenhouse gas emissions. 1 2 "Selected Development Indicators" (PDF). World Development Report 2010: Development and Climate Change (PDF). Washington, D.C., USA: The International Bank for Reconstruction and Development / The World Bank. 2010. Tables A1 and A2. doi:10.1596/978-0-8213-7987-5. ISBN 9780821379875. 1 2 Bader, N.; Bleichwitz, R. (2009). "Measuring urban greenhouse gas emissions: The challenge of comparability. S.A.P.I.EN.S. 2 (3)". Sapiens.revues.org. Retrieved 2011-09-11. 1 2 3 4 5 6 7 8 Banuri, T. (1996). Equity and social considerations. In: Climate change 1995: Economic and social dimensions of climate change. Contribution of Working Group III to the Second Assessment Report of the Intergovernmental Panel on Climate Change (J.P. Bruce et al. Eds.) (PDF). This version: Printed by Cambridge University Press, Cambridge, UK, and New York, USA. PDF version: IPCC website. doi:10.2277/0521568544. ISBN 978-0-521-56854-8. ↑ World energy outlook 2007 edition – China and India insights. International Energy Agency (IEA), Head of Communication and Information Office, 9 rue de la Fédération, 75739 Paris Cedex 15, France. 2007. p. 600. ISBN 978-92-64-02730-5. Retrieved 2010-05-04. ↑ Holtz-Eakin, D. (1995). "Stoking the fires? CO2 emissions and economic growth". Journal of Public Economics. 57 (1): 85–101. doi:10.1016/0047-2727(94)01449-X. Retrieved 2011-04-20. ↑ B. Metz; O. R. Davidson; P. R. Bosch; R. Dave; L. A. Meyer, eds. (2007). "Annex I: Glossary J-P". Climate Change 2007: Mitigation. Contribution of Working Group III to the Fourth Assessment Report of the Intergovernmental Panel on Climate Change. Print version: Cambridge University Press, Cambridge, United Kingdom and New York, USA. This version: IPCC website. ISBN 978-0-521-88011-4. Retrieved 2011-04-11. ↑ Markandya, A. (2001). "7.3.5 Cost Implications of Alternative GHG Emission Reduction Options and Carbon Sinks". In B. Metz; et al. Costing Methodologies. Climate Change 2001: Mitigation. Contribution of Working Group III to the Third Assessment Report of the Intergovernmental Panel on Climate Change. Print version: Cambridge University Press, Cambridge, U.K., and New York, N.Y. This version: GRID-Arendal website. doi:10.2277/0521015022. ISBN 978-0-521-01502-8. Retrieved 2011-04-11. ↑ Herzog, T. (November 2006). Yamashita, M. B., ed. Target: intensity — an analysis of greenhouse gas intensity targets (PDF). World Resources Institute. ISBN 1-56973-638-3. Retrieved 2011-04-11. ↑ Botzen, W. J. W.; et al. (2008). "Cumulative CO2 emissions: shifting international responsibilities for climate debt". Climate Policy. 8: 570. doi:10.3763/cpol.2008.0539. 1 2 3 Höhne, N.; et al. (24 September 2010). "Contributions of individual countries' emissions to climate change and their uncertainty" (PDF). Climatic Change. Springer Science+Business Media B.V. 106: 359–391. doi:10.1007/s10584-010-9930-6. ↑ The cited paper uses the term "start date" instead of "base year." 1 2 3 "Global CO2 emissions: annual increase halves in 2008". Netherlands Environmental Assessment Agency (PBL) website. 25 June 2009. Retrieved 2010-05-05. ↑ "Global Carbon Mechanisms: Emerging lessons and implications (CTC748)". Carbon Trust. March 2009. p. 24. Retrieved 2010-03-31. ↑ Helm, D.; et al. (10 December 2007). Too Good To Be True? The UK's Climate Change Record (PDF). p. 3. 1 2 3 Davis, S. J.; K. Caldeira (8 March 2010). "Consumption-based Accounting of CO2 Emissions" (PDF). Proceedings of the National Academy of Sciences of the United States of America. 107 (12): 5687–5692. Bibcode:2010PNAS..107.5687D. doi:10.1073/pnas.0906974107. Retrieved 2011-04-18. ↑ "International Carbon Flows". Carbon Trust. May 2011. Retrieved 12 November 2012. ↑ e.g., Gupta et al. (2007) assessed the scientific literature on climate change mitigation policy: Gupta, S.; et al. (2007). Chapter 13: Policies, instruments, and co-operative arrangements. In: Climate Change 2007: Mitigation. Contribution of Working Group III to the Fourth Assessment Report of the Intergovernmental Panel on Climate Change (B. Metz, O.R. Davidson, P.R. Bosch, R. Dave, L.A. Meyer (eds)). Cambridge University Press. ISBN 9780521880114. ↑ "International Energy Agency — Energy Policy". Paris, France: International Energy Agency (IEA). 2012. ↑ "IEA Publications Bookshop: IEA Publications on 'Energy Policy'". Paris, France: Organization for Economic Co-operation and Development (OECD) / International Energy Agency (IEA). 2012. ↑ "4. Energizing development without compromising the climate" (PDF). World Development Report 2010: Development and Climate Change (PDF). Washington, D.C., USA: The International Bank for Reconstruction and Development / The World Bank. 2010. p 192, Box 4.2: Efficient and clean energy can be good for development. doi:10.1596/978-0-8213-7987-5. ISBN 9780821379875. ↑ Sixth compilation and synthesis of initial national communications from Parties not included in Annex I to the Convention. Note by the secretariat. Executive summary. (PDF). Geneva, Switzerland: United Nations Framework Convention on Climate Change (UNFCCC). 2005. pp. 10–12. 1 2 3 4 Compilation and synthesis of fifth national communications. Executive summary. Note by the secretariat. (PDF). Geneva (Switzerland): United Nations Framework Convention on Climate Change (UNFCCC). 2011. pp. 9–10. ↑ Fisher, B.; et al. (2007). "3.1 Emissions scenarios". In B. Metz; O. R. Davidson; P. R. Bosch; R. Dave; L. A. Meyer. Chapter 3: Issues related to mitigation in the long-term context. Climate Change 2007: Mitigation. Contribution of Working Group III to the Fourth Assessment Report of the Intergovernmental Panel on Climate Change. Cambridge University Press. ISBN 978-0-521-88011-4. ↑ "Greenhouse Gas Emissions from a Typical Passenger Vehicle, US Environment Protection Agency" (PDF). Epa.gov. Retrieved 2011-09-11. ↑ Engber, Daniel (1 November 2006). "How gasoline becomes CO2, Slate Magazine". Slate Magazine. Retrieved 2011-09-11. ↑ "Volume calculation for carbon dioxide". Icbe.com. Retrieved 2011-09-11. ↑ "Voluntary Reporting of Greenhouse Gases Program". Energy Information Administration. Retrieved 21 August 2009. ↑ Obersteiner M; Azar C; Kauppi P; et al. (October 2001). "Managing climate risk". Science. 294 (5543): 786–7. doi:10.1126/science.294.5543.786b. PMID 11681318. 1 2 3 "Geoengineering the climate: science, governance and uncertainty". The Royal Society. 2009. Archived from the original on 7 September 2009. Retrieved 12 September 2009. ↑ Fischer, B.S., N. Nakicenovic, K. Alfsen, J. Corfee Morlot, F. de la Chesnaye, J.-Ch. Hourcade, K. Jiang, M. Kainuma, E. La Rovere, A. Matysek, A. Rana, K. Riahi, R. Richels, S. Rose, D. van Vuuren, R. Warren, (2007)"Issues related to mitigation in the long term context", In Climate Change 2007: Mitigation. Contribution of Working Group III to the Fourth Assessment Report of the Inter-governmental Panel on Climate Change [B. Metz, O.R. Davidson, P.R. Bosch, R. Dave, L.A. Meyer (eds)], Cambridge University Press, Cambridge. Van Dijk, P.; Zhang, J.; Jun, W.; Kuenzer, C.; WOLF, K. H. (2011). "Assessment of the contribution of in-situ combustion of coal to greenhouse gas emission; based on a comparison of Chinese mining information to previous remote sensing estimates". International Journal of Coal Geology. 86 (1 Special Issue RS/GIS): 108–119. doi:10.1016/j.coal.2011.01.009.